Omnium Gatherum has been a mainstay in the Melodic Death Metal world since their conception in Finland in 1996 by guitarist Markus Vanhala (also of Insomnium fame). The band has grown from strength to strength over the years, touring rigorously and growing their sound to include a progressive flair to their signature aggressive melodic death metal roots. Since working with Swedish death metal alumni Dan Swano in 2007 on their 4th album, ‘The Redshift’, the band has gone on to release high charting albums including Melodeath staple album, ‘New World Shadows’. The band has worked with Dan Swano once more to create their critically acclaimed 8th studio album, ‘The Burning Cold’, a showcase of absolute melodic and progressive mastery which has been met with universal praise around the world. 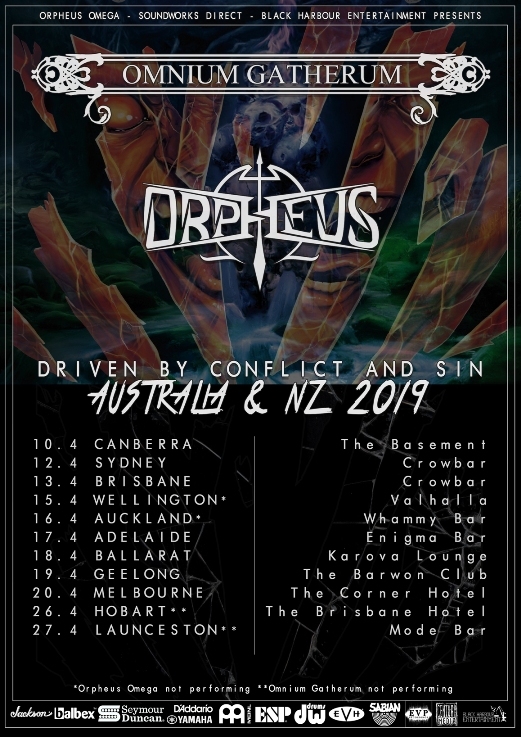 Now the band is bringing the burning cold to Australia in 2019 for their FIRST EVER time down under alongside Australian Melodeath maestros, Orpheus Omega. Conceived in Melbourne, Australia in 2008, the band has gone on to become one of Australia’s premier Melodic Death Metal acts. Touring rigorously both nationally and abroad, the band has shared the stage with some of the heavy weights of modern metal including Trivium, Children Of Bodom, Dark Tranquillity, Amon Amarth, Soilwork, At The Gates, Insomnium and more. With their aggressive approach to classic Melodic Death Metal, the band blends catchy hooks and melodies with crushing riffs seamlessly bringing them into a sound of their own as shown from their highly acclaimed 2015 concept album, ‘Partum Vita Mortem’. Now in 2019, Orpheus Omega are set to release their relentless 4th album, ‘Wear Your Sins’ (Mixed at Monolith Studios/ Mastered by Thomas Plec Johansson at The Panic Room) to the world through EVP Recordings. With a wide breadth of melody and surgical riffs, the album is both thematically and musically the darkest and most intense release the band has created yet and further solidifies their strong standing as one of Australia’s hardest working bands.